Preschool QuickSource® reminds us that "Through hands-on experiences with counting, children learn important number concepts and operations. 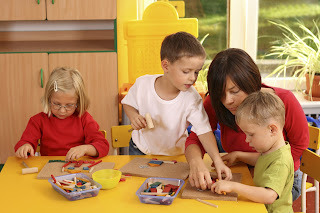 Children begin to make these connections with activities involving counting in sequence, comparing numbers of objects, using one-to-one correspondence, and counting to determine quantity." Here's an activity called Extending Patterns. The goal of this activity is to encourage children to create patterns by extending and comparing. Before you begin, gather your materials: manipulatives of several duplicated items, and sorting trays. 1) Using the manipulatives, create a simple ABAB pattern using the attribute of color, for example: red counting disk, yellow disk, red disk, yellow disk. This pattern can be created in a line on a tabletop, or as a circle in a sorting tray. 2) Ask the child to identify which color disk would come next in that pattern. 3) Progress to other attributes, such as animals or size according to the child’s developmental level. (Geometric shapes should not be used until the child has mastered shape identification.) This activity can also be extended to more difficult patterns, such as: ABCABC, AABBAABB, etc. If using POCET™, this activity correlates to Developmental Guidelines: MA4: Creates Patterns by Extending and Comparing.